Old map by DE BRY - The Dutch are attacked by giant crabs. 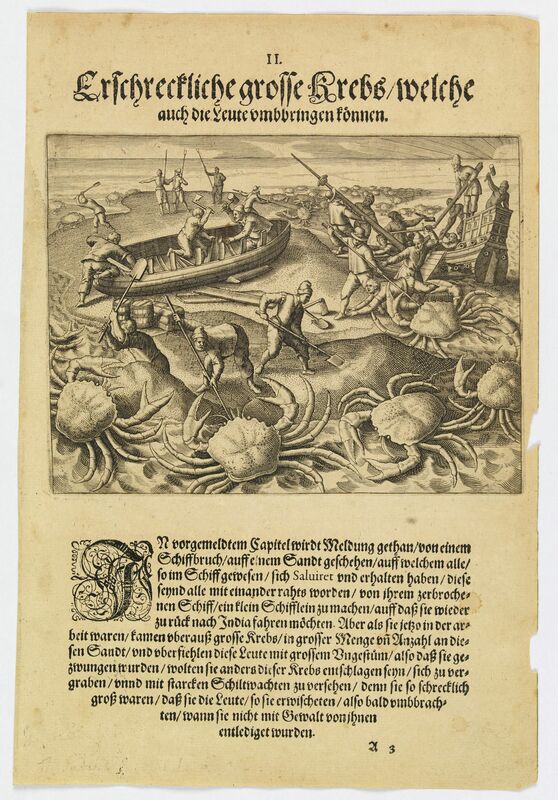 Title: The Dutch are attacked by giant crabs. 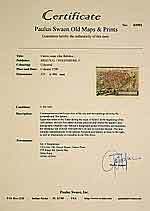 Size: 5.5 x 7.0 inches. During their return voyage, the Portuguese were wrecked on a sandbank (the Seychelles?) From the debris they began building a smaller ship in which they hoped to return to India. While they were stranded on this sandbank, numerous monster crabs appeared and began to attack them. To protect themselves, the men had to beat them off, rescuing each other from their claws, while they built an escutcheon. Theodore de Bry, a German engraver and book dealer, began a compilation of early voyages in 1590 and had published six parts at the time of his death in 1598. His widow, two sons, and another family member continued the work, which comprised a total of fifty-four parts when it was completed in 1630. The publication is in two series, denoted the Grands Voyages and the Petit Voyages. A German edition of the Petit Voyages was published in 1599 in Frankfurt am Main. A second German edition came out in 1616. Latin editions were published in 1609 and 1629.